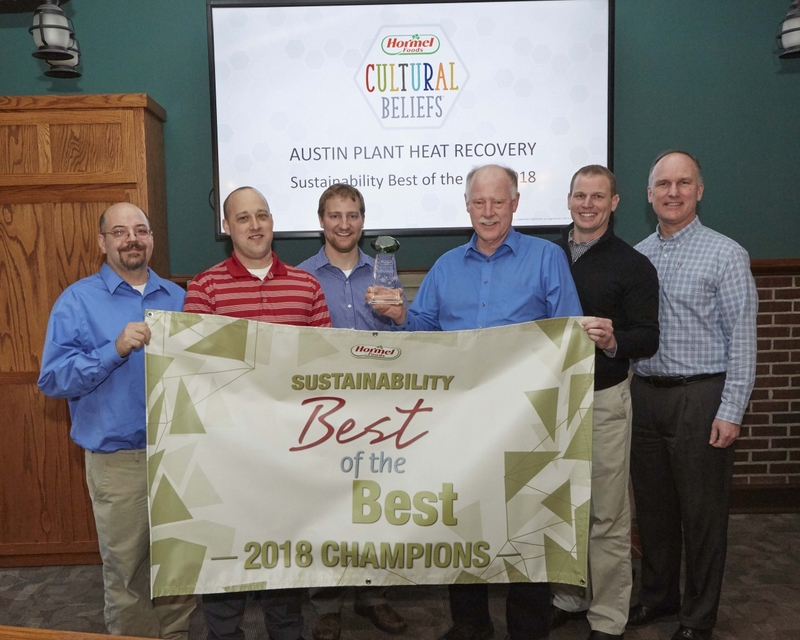 AUSTIN, Minn., February 4, 2019 /3BL Media/ – Hormel Foods Corporation (NYSE: HRL) has announced its Austin (Minn.) Plant team has been named the company’s 2018 Environmental Sustainability Best of the Best champion for its heat recovery project. The internal annual Environmental Sustainability Best of the Best award program, now in its 11th year, recognizes teams for their achievements in reducing environmental impacts. The Austin Plant team’s winning project focused on the design and installation of the most efficient heat recovery system available to meet the plant’s needs, which resulted in an annual energy savings of 101,000 MMBtu and an additional 17 million gallons of water. The other finalists in the company’s 2018 competition included the company’s Ceratti (San Paulo, Brazil) team for their project that reduced boiler emissions, the Don Miguel Foods (Dallas, Texas) team for their water pretreatment improvements project and the Osceola (Iowa) Food team for their wastewater organic loading reduction project. The Austin Plant team was named the champion by a panel of judges at the company’s Corporate Office in Austin, Minn., based on the criteria of project scope and goal setting, team work, project solving, achievement and savings. In total, 41 projects were entered in the competition, which documented these annual savings: over 62 million gallons of water, 146,000 MMBtu and 359 tons of solid waste. For more information about the company’s environmental stewardship efforts, please visit https://csr.hormelfoods.com/. Hormel Foods Corporation, based in Austin, Minn., is a global branded food company with over $9 billion in annual revenues across more than 80 countries worldwide. Its brands include SKIPPY®, SPAM®, Hormel® Natural Choice®, Applegate®, Justin’s®, Wholly Guacamole®, Hormel® Black Label®, Columbus® and more than 30 other beloved brands. The company is a member of the S&P 500 Index and the S&P 500 Dividend Aristocrats, was named one of “The 100 Best Corporate Citizens” by Corporate Responsibility Magazine for the tenth year in a row, and has received numerous other awards and accolades for its corporate responsibility and community service efforts. In 2016, the company celebrated its 125th anniversary and announced its new vision for the future — Inspired People. Inspired Food.™ — focusing on its legacy of innovation. For more information, visit www.hormelfoods.com and http://csr.hormelfoods.com/.